The standard view of the notifications in the notification drawer. A large view that’s visible when the notification is expanded. Big view is part of the expanded notification feature available as of Android 4.1.
don’t it defaults to the time that the system received the notification. notification with a gesture. Expanded notifications are available starting with Android 4.1.
the system by calling NotificationManager.notify(). That’s it. Your user has now been notified. call Builder.setStyle() with a big view style object as its argument. 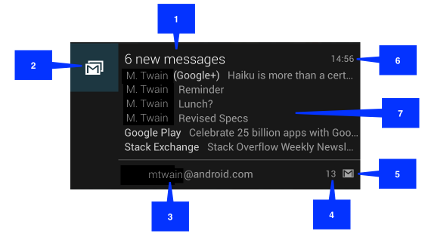 learn how to handle notifications for Android 4.1 and for earlier platforms, read the section Handling compatibility. // Moves the big view style object into the notification object.